Come visit the production facility for Nelson County’s original brewery, Blue Mountain Brewery. Opened in 2012 to supplement the growing demand of our original brewery restaurant on Rt. 151 in Afton, our strikingly beautiful “Blue Mountain Barrel House” location boasts mountain views to rival anything this side of the Mississippi as well as one of the largest beer barrel-aging facilities on the East Coast. The Barrel House is situated on 15 acres right off Rt. 29 South, conveniently located between Charlottesville and Lynchburg. We always have 6 beers on draft and a huge selection of six-packs, cans, big bottles and growlers from both our Blue Mountain and South Street Brewery brands. We have a picturesque spread of outdoor space, games inside and out, weekend tours on demand, our Blue Mountain Grille food truck on Fridays and Saturdays, Friday Cheers with bands most of the year, and special events and beer releases. 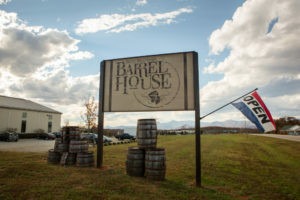 Come visit us 7 days a week at Blue Mountain Barrel House and get an inside view on how we continue to lead the craft beer revolution in Virginia! Friday Cheers: Live music every Friday May-October 6-8. Please visit our website www.bluemountainbrewery.com for more information.